A luxury, handmade, Caribbean experience, where natural warmth and beauty surrounds a sense of calm, serenity and pampering. Perched on 11 acres of immaculate beachfront, the Grace Bay Club in Turks & Caicos offers guests a quiet haven for uninterrupted relaxation. The hotel features 59 ultra-spacious suites, each no less than 600 square feet, featuring oceanfront views, Egyptian cotton linens and luxury featherbeds. 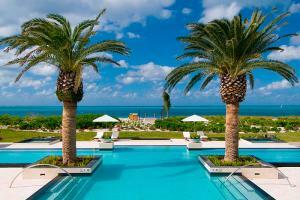 Located in Providenciales, Turks & Caicos Islands. 1 ½-hour flight from Miami.